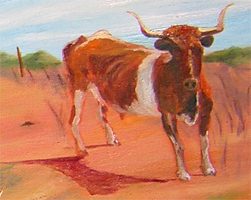 The idea for this painting came from a visit to a ranch in the Texas Hill Country for a church retreat. 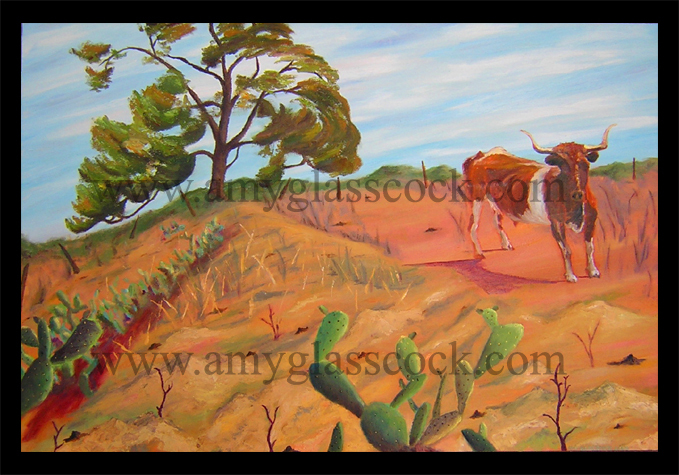 The ranch was filled with beautiful patches of cactus and trees. Me and some friends decided to walk around and explore. We not only came upon a plethora of cow patties, but also one of the culprits: this bull. He was just standing there staring at us ominously. So, of course, I went closer to him to take his photo. This is a commissioned painting for the Hogan's of Dallas Texas. You can see what this painting looked like in progress here and as a special bonus you can see my extraneous inspirations too. Check it out I am on their website! a way in the desert and streams in the wasteland."